Copyright © 2011-2019 SanifloStore.com. All rights reserved. As a user, you are authorized only to view, copy, print, and distribute documents on this Web site so long as (1) the document is used for informational purposes only, and (2) any copy of the document (or portion thereof) includes the following copyright notice: Copyright © 2011-2019 SanifloStore.com. All rights reserved. This site may contain other proprietary notices and copyright information, the terms of which must be observed and followed. Information on this site may contain technical inaccuracies or typographical errors. Information, including product pricing and availability, may be changed or updated without notice. SanifloStore.com and its subsidiaries reserve the right to refuse service, terminate accounts, and/or cancel orders in its discretion, including, without limitation, if SanifloStore.com believes that customer conduct violates applicable law or is harmful to the interests of SanifloStore.com and its subsidiaries. Free shipping applies to the lower 48 only, locations beyond may be subject to additional charges. All Saniflo kits require a signature upon receipt, please open immediately to check contents for damage. 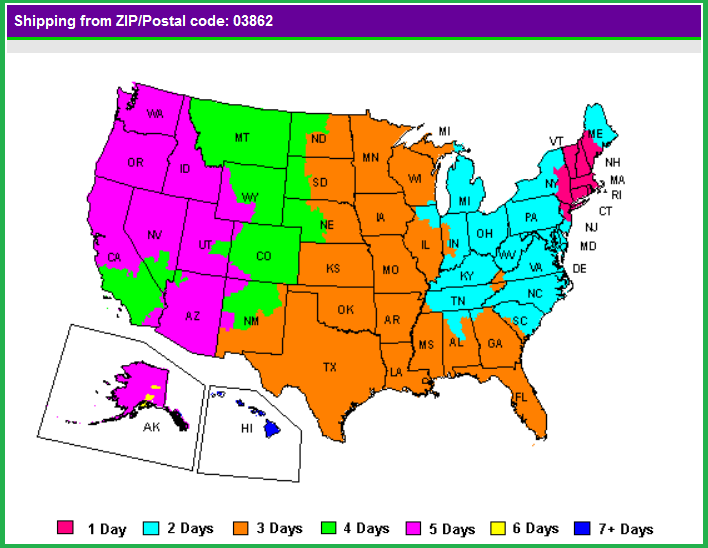 All shipments travel via Fed Ex Ground and typically ship the same day the order is placed. ETA is outlined on the map below, feel free to contact us if you have questions. Shipping laws are different in each country. It is your responsibility to check with your Customs office to verify whether the country to which you are shipping permits the shipment of your products. SanifloStore.com is not responsible for any direct, indirect, punitive, or consequential damages that arise from improper international shipping practices. Please note that certain items in our store are unable to be shipped internationally, or may not be compatible with electrical systems in your country. All Saniflo pumps carry a 3 year manufacturers warranty, be sure to register your system with the provided post card or on www.saniflo.com . If something should happen during this period please contact Saniflo directly at 800-571-8191 ask for Technical Support. If you need a copy of your invoice please contact us directly. 30 Day- No Worries Return Policy: If your project changed, no worries you can return your items. Returns are accepted within 30 Days of Purchase Date for any reason. Items must be returned in new unopened condition, if your item is opened and handled you will be charged a 10% restocking fee. The buyer is responsible for the original shipping charges and the return shipping charges. Please contact us in advance to obtain an RMA# for your return, you must notify us at this time if the system has been opened. * Illinois customers please check with local code prior to purchasing. Although the information on this Web site is accessible worldwide, not all products or services discussed in this Web site are available to all persons or in all geographic locations or jurisdictions. SanifloStore.com and the advertisers each reserve the right to limit the provision of their products or services to any person, geographic area, or jurisdiction they so desire and to limit the quantities of any products or services that they provide. Any offer for any product or service made in the materials on this Web site is void where prohibited. GOVERNING LAW: In the event of litigation both parties agree that the Law of the State of business registration of SanifloStore.com shall apply and both parties shall consent to the jurisdiction of said State's courts, or in the event of diversity of citizenship, the United States District Court for the (District). Both parties expressly waive a trial by jury. MISCELLANEOUS: The Terms and Conditions constitute the entire agreement between you and SanifloStore.com with respect to this Web site. The Terms and Conditions supercede all prior or contemporaneous communications and proposals, whether electronic, oral or written between you and SanifloStore.com with respect to this Web site. No modification of the Terms and Conditions shall be effective unless it is authorized by SanifloStore.com. If any provision of the Terms and Conditions is found to be contrary to law, then such provision(s) shall be constructed in a manner to closely reflect, as much as possible, the intentions of the parties, with the other provisions remaining in full force and effect.